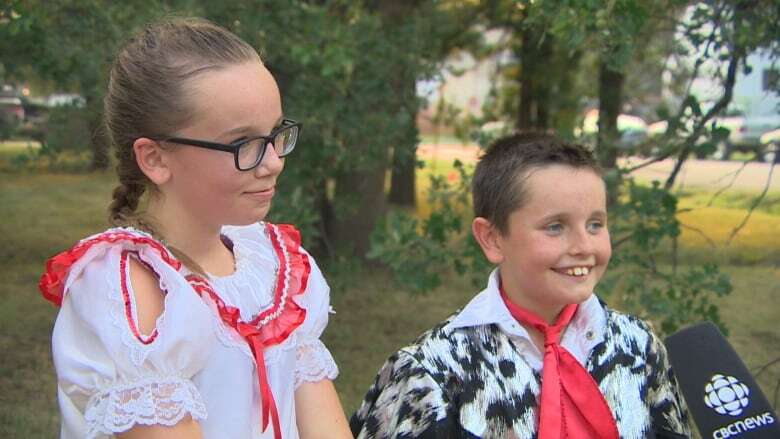 Days after they survived the gyrating winds of the Alonsa tornado, two young members of the Oleschak family were hurling themselves around on stage at Folklorama. On Aug. 3, Hayley and Hunter Oleschak were among 40 people who huddled in the basement of their grandparents' home near Margaret Bruce Beach while an EF-4 tornado tore across the property on its way to Lake Manitoba. Hayley, 12, and 10-year-old Hunter survived the ordeal, along with everyone else who took shelter on the Oleschak property. They recovered in time to perform three nightly shows at the Mé​tis Pavilion as part of the Asham Stompers, a jigging dance troupe. ​"I don't think about anything. I just dance and do my stuff," Hunter said Thursday in between performances at the Heather Curling Club in St. Boniface. "Once you're done, it brings everything back." 'It was massive': Survival stories emerge in wake of deadly tornado in Alonsa, Man. The Aug. 3 tornado that hit the Alonsa area killed one man, 77-year-old Jack Furrie, and destroyed several homes, trailers, vehicles and farm structures. It also destroyed an outbuilding on the Oleschak property. Both Hunter and Hayley saw and heard the twister as it chewed its way across the RM of Alonsa. "You could see debris flying everywhere and trees were breaking," Hayley said. "It sounded like a freight train, going right by your face," added Hunter. They said they spent their time in the basement of the Oleschak home under a mattress, placed there by their dad, "just in case a tree fell on the house," Hunter said. The Oleschak siblings learned to jig from their aunt, starting when they were two or three. This week marked the first time they performed as part of Folklorama. "Lots of excitement, lots of people," said Hunter, who had already experienced more excitement this summer than any kid could would want. Folklorama continues until Aug. 19. The Mé​tis pavilion's run ends Saturday.